Doom Patrol: New 52 Doom Patrol - FINALLY!!! New 52 Doom Patrol - FINALLY!!! Or maybe the title of this post should be A NEW POST! FINALLY!!! Happy New Year friends! It's been teased for a while, but it looks like we FINALLY get a chance to meet the New 52 version of the Doom Patrol in Justice League #27 coming up on January 22 from DC Comics. I drafted the book in our weekly review draft on Comic Book Resources, so I decided to see if there was a preview out there. After all, some of the Forever Evil-related stories have been less than inspired and nowhere near inspiring. Sure enough on Nerdist, I found a sweet little preview that includes this fine page. I redacted out a bit of a spoiler, so be warned if you go to Nerdist. Looks like Justice League #27 is going to include Scott Fischer and Karma. Ivan Reis, Joe Prado and Rod Reis on the visuals, Geoff Johns on the words. Looks pretty slick to me. 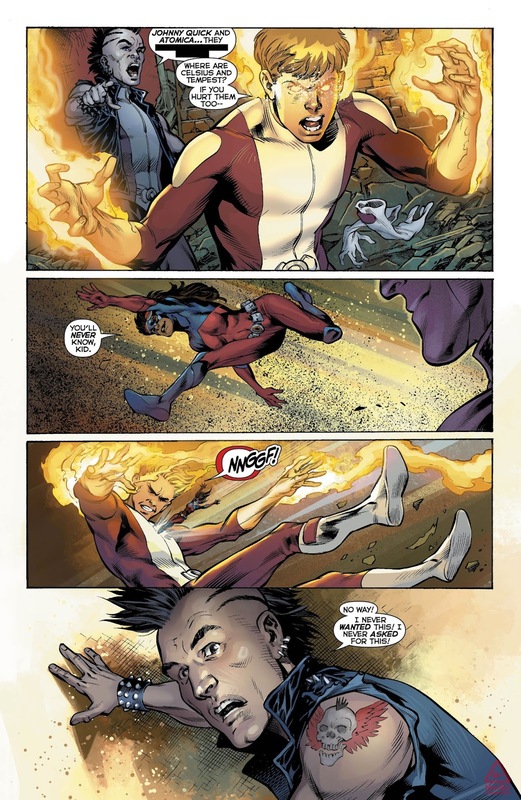 Hopefully the DP is able to hold their own against Atomica and Johnny Quick. I'd hate for their first appearance to be their last. Of course them surviving would be more unexpected than any pending mutilations and murders given the current state o DC Comics. So Patrollers, what say you? Find out what I think of Justice League #27 on Wednesday, January 22 at CBR. Aw yeah, I'll buy it. Thanks for circulating info on the preview. Metal Men and Doom Patrol both coming to Justice League?!?!? Looking forward to this! Tapping that DC Silver Age joy! Glad to see you back in the blogosphere!! Yessir, Shag (or Shav) I'm back. I never actually left, I just became more intermittent, like windshield wipers in a light mist. I have one foot in the too jaded by the DC52 train to be honest. I'm liking the fact folk like Adam Strange, Batman Beyond, Firestorm and The Doom Patrol are coming back (and you as a result), but even though the Patrol got kind of 52'ed between the Vertigo and DC years, I'm nervous about picking this up, incase the new version of one of my favourite teams just makes me feel more of a stranger to the universe that was my favourite. Hey Dan! Looks like Johns might be flipping DP history around a bit. Check out the issue to see what I mean there. Or, if you'd rather, shoot me an email and we'll discuss without you having to shell out any money. Hi Doug! This might be a little off-topic, but I was wondering if Titan Books (UK) ever ended up publishing Doom Patrol Vol.3: Fire Away in November, 2011. DC had cancelled their release, but according to numerous websites, Titan published the 3rd volume months later. But they no long do DC books, and there doesn't seem to be copies floating around online. Can yourself or anyone else confirm this? Petar, I'll be honest, I don't know for certain. From what I can glean on CBR's forums, it was simply cancelled due to underwhelming orders. New 52 strikes again! After all, why would retailers have had any interest in ordering product that was going to be outdated before it even hit the shelves? Its a shame Scott and karma were killed off.